I don’t believe in failure. What others call a failure I call them lessons on what didn’t work, opportunities for improvement, and in some cases, the “failure” was an improvement. In each “failure” I learned something new or proved my hypothesis was wrong, and I needed to analyze what happened and why. Make it better then next time around. I learned that you MUST make sure your system and all components are clean despite what people tell you. When I first started, I used 55 gal drums that previously contained vinegar. I bought them, and because the seller said they were cleaned, I started cycling my system. Well there was some residual in the containers and my pH was way off. Thus killing my first batch of fish and lesson two at the same time. You must cycle your system for a while, and it depends on the size before adding plants and fish. I researched some and my first attempt was just to see if I could do it. Then learning from my mistakes I began to research more and understand the underlying fundamentals. 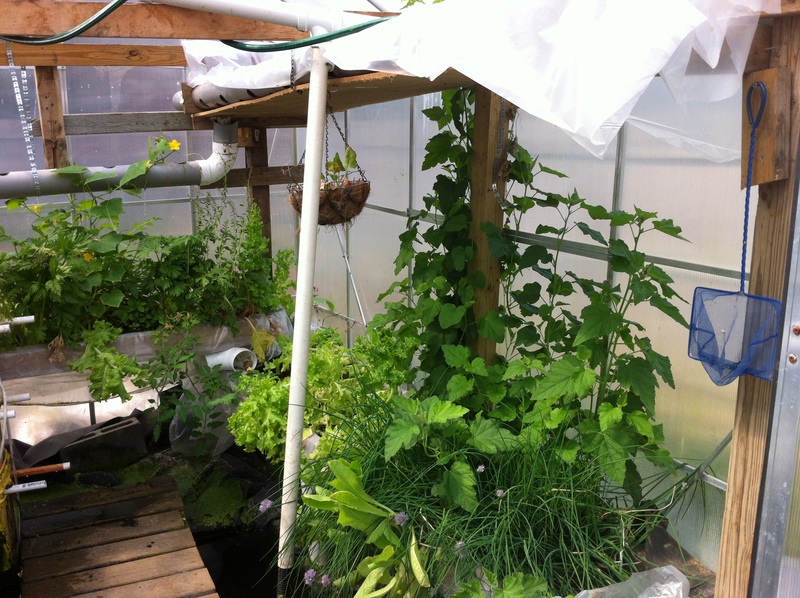 There are three main components to aquaponics and each must work together effectively. If one of the three are out of balance then the other two get out of whack as well. Fish, plants, and bacteria. The bacteria break down the waste products of the fish, so the plants can take up the waste of the bacteria. 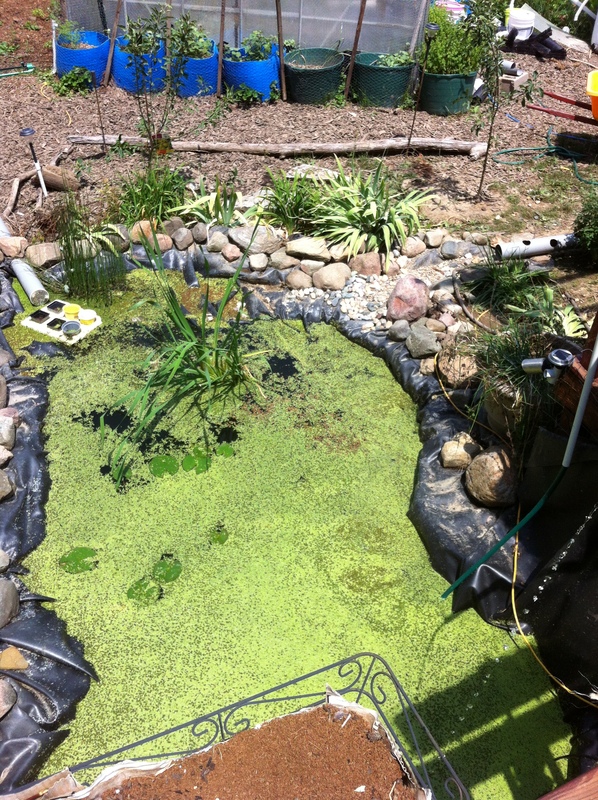 The plants clean the water and grow off the bacteria waste, and then can feed the fish. At least in my case the duckweed feed the fish. I say that your cycle time is dependant on the size because not two systems are alike and not one solution fits the situation. You could be using a 30 gallon indoor system, or a 55 gal outdoor system and the cycle time is different for each, as well as how you flow the system, and the media you use, the amount of light, what type of water you use. How you start your ammonia for the bacteria to begin digestion etc. All can vary your system requirements. You can learn a lot more from doing than theory and reading. From my research several sites, and books said you should only grow leafy plants such as lettuce, herbs etc. and you couldn’t grow fruiting plants. Last year I grew melons, cucumbers tomatoes, beans, peas, chives and water chestnut. I try something and if it works great, if not, I note it, and try it again a few more times to confirm the results. My 1st few attempt at growing peppers, cucumbers, tomatoes and beans failed. I was attempting to start them from seeds in the system. I learned you need to get the plants started in some sort of media then transfer. I used coconut coir. 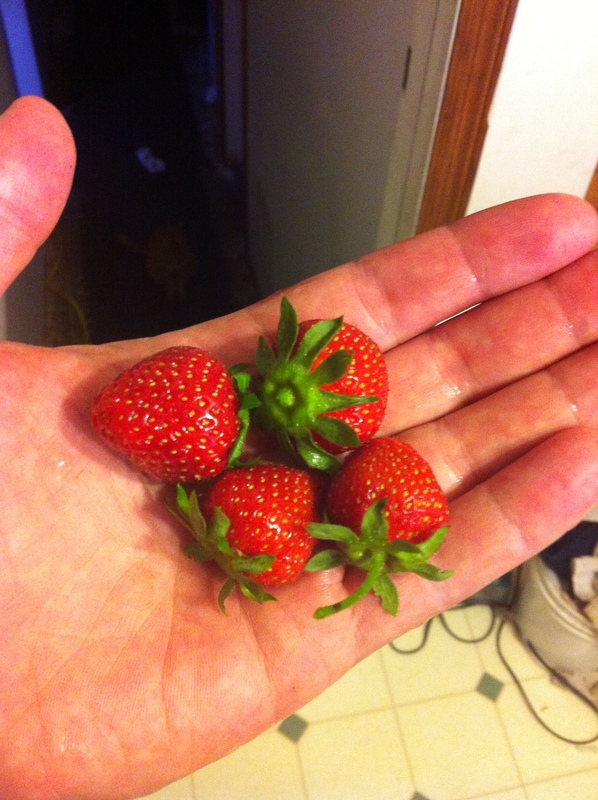 I am attempting strawberries in addition to celery, marshmallow root, leaks, and some of my other past accomplishments. Start with “disposable” fish. In my area tilapia are about $2 a fish for fingerlings. Catfish $1 for each 4 inch fish. When stocking a 2000 gallon system that is a big investment to have all of them die off. I used feeder goldfish from my local pet store. 100 for $12.49. My 1 inch fish I started with are not about 1-2lbs each. Goldfish are pretty hardy, they will survive through winter water temps below 40 degrees, they eat just about anything, and produce a lot of waste. Can you eat goldfish? Yup, it is of the carp family. But I doubt I would ever eat them. Because of their high waste output a larger bio filter is needed, but means a higher plant food source. We have added bluegill, read ear, and catfish as we catch them while fishing. Some fish are too small to eat, but they are great to add to the aquaponics and allow to grow to a bigger size. Don’t believe you have to have a commercial system or parts. I wouldn’t ever but the thousand plus dollar kits they sell online. 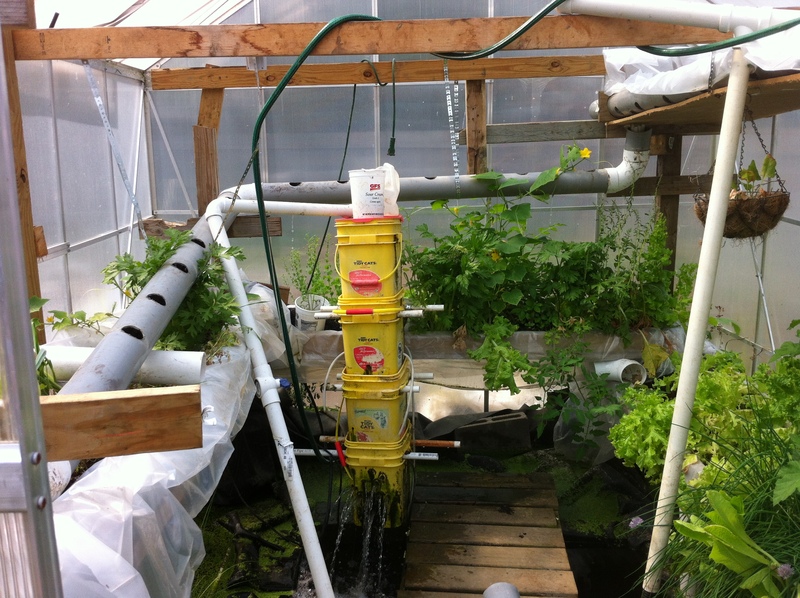 You can make an aquaponic system with just about anything. If it will hold water you can have a system. 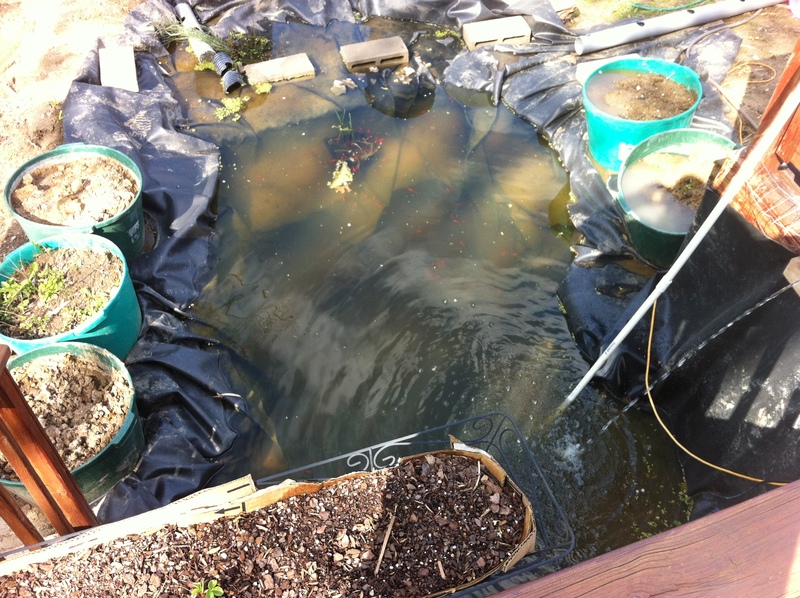 Rubbermaid plastic totes, 55 gal plastic drums, aquariums, in ground ponds. You also don’t need a commercial biofilter. I made mine out of plastic cat litter containers I found at my recycle center, landscaping lava rock, and seeded it with bacteria from a local pond. All free. I attempted to use pipe as my grow area. This would work if you harvested the entire plant. I wanted to be able to pick a few things, and let the plants continue to produce. The roots end up clogging the system. So now I have adopted grow beds. There are so many other things I know now that I would have done differently if I had to do it all over. I could have learned much of this from following someone else step and what they did. I could have bought a kit and paid for tech help and support. But I don’t think I would have learned as much about my own system. When something breaks I know how to fix it. I have learned to adapt other materials for my purpose, cat litter boxes, landscaping lava rocks etc. It would have definitely cost mre more. Experiment, learn what works for you and your system. Want to start your own system? Let me help. I can discuss pitfalls and lessons learned. Help with sourcing materials that won’t break the bank. If you are in the Indianapolis area or are located in Indiana I can provide onsite help and consulting. Check out the consulting and contact us pages. I was jealous of my neighbors “water feature” and wanted one. I couldn’t justify the cost of putting one in and it not be productive. Then while cleaning out my MIL junk barn, we found a small plastic pond. 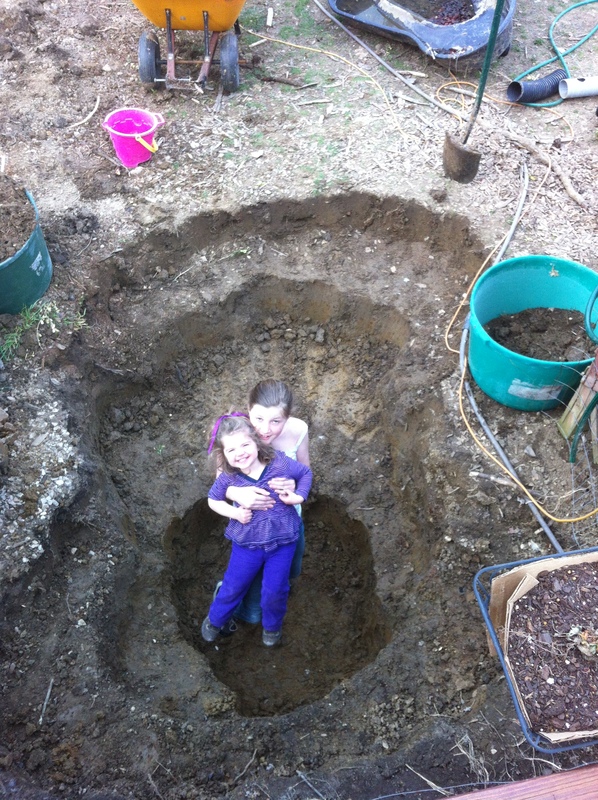 I dug a hole, and with a spare pump from my greenhouse aquaponics I had a water feature. No extra cost. But how to make it productive? Fast forward a year. I decided I wanted a bigger pond and stock with fish. So again I dug the hole by hand. It kept getting bigger and bigger as I thought of all the things I could add. Here is a picture of the hole. it is 4 1/2 feed at the deepest 15 feet long and 8 feet wide. Next we added a roofing liner. I chose EDPM, 60 mil thick. I got a change through my professional work history to meet an engineer who works at firestone. Who make both roofing liners and pond liners. The material is identical. The only difference is the anti caking agent they use when rolling it or folding it. But here’s the catch, the pond liner is quite a bit more expensive. I just bought the roofing liner, and washed it several times, then with soap, and rinsed a few more. I cycled my system for several weeks before adding fish or plants. Here are some photos of the system when we just got started. Here is the same angle today. The overflow from my rain catchment system goes into the pond. 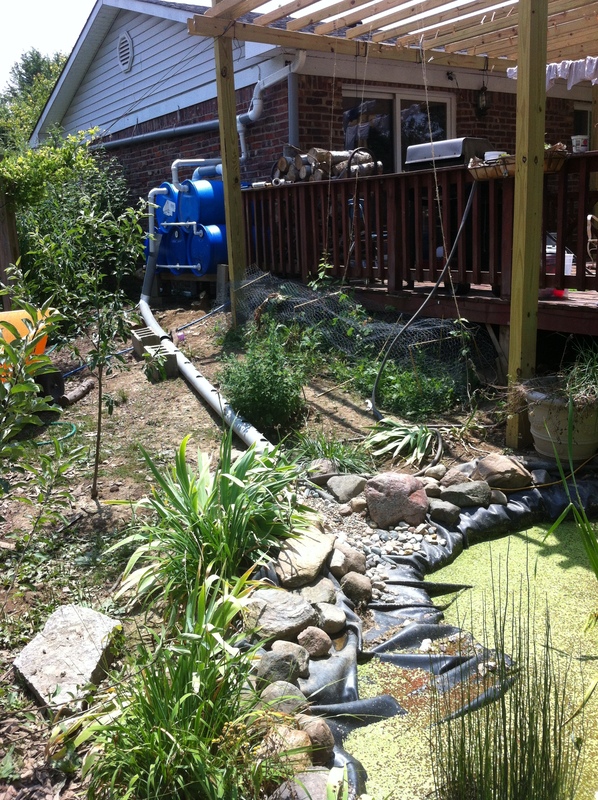 After a few spots in the yard heal from chicken devastation, I will swale and fence in the area to remove the pipe. It is only there to keep the water from eroding the surface soil. The overflow of the pond goes into my garden. When stocking with fish I use pet store feeder fish. Here locally I can get 100 different colored and patterned goldfish for $12.79. They are pretty hardy to get the system started, and add some color. The fish I started 18 months ago were around 1” and now are 9”+ and 1-2 lbs each. I feed duckweed and a handful or organic fish pellets. Duckweed will duplicate every 24 hrs in summer, and has more protein than soy and the feed I give them. I bought my first duckweed from a pond store, and it just keeps going. I have given duckweed to people on tours when asked and now sell if anyone wanted to start their own for their systems. For the production piece. I added drip irrigation to recycled plastic containers which I hung from my deck railing. I took 2L bottles and cut off the bottom. Then drilled holes in the lids. The top bottle drills to the second, and then to the third, which drains back into the pond. In each bottle I used coconut coir as media. We planted cucumber, 3 kinds of melons, 5 varieties of lettuce, strawberries, peppers, and cilantro. The liner is pulled up so high to catch the drip irrigation and to keep chickens and the dog from the back side of the pond. 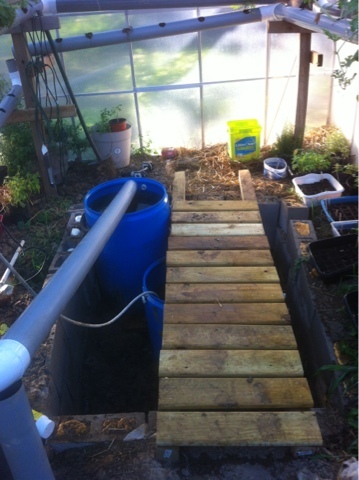 For the biofilter I again built my own. 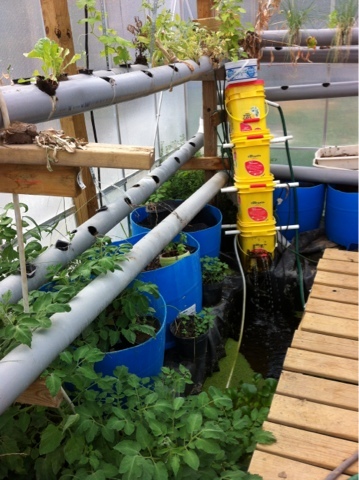 Recycled plastic feed containers, and PVC pipe. Inside there are river rock, lava rock, pea gravel and more coconut coir. 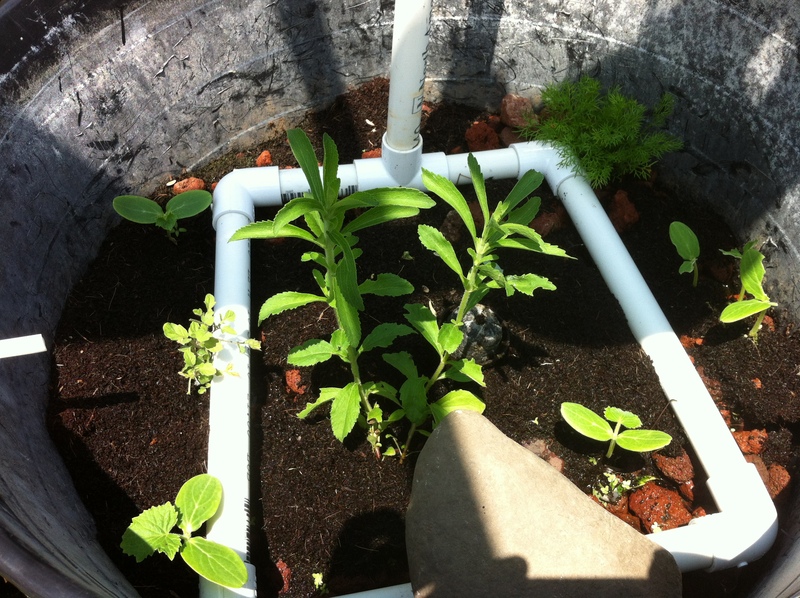 The top container flows to the second which has a diverter and the drip irrigation. Again all recycled parts. Most of the plants I started from seed. The only things that cost me anything were the pump, bought off season for 75% off, and the liner. Since I bought roofing liner, rather than pond liner it saved me a few hundred dollars. The fish, but now we restock it ourselves when we go fishing. Any minnows that don’t get used, or fish that are too small to eat go to the pond to grow, and keep down mosquito population. The rocks were picked up from fields that get plowed. the 55 gallon drum serves no purpose than giving additional height. I am working on another system of hanging baskets from the pergola to give more growing area. 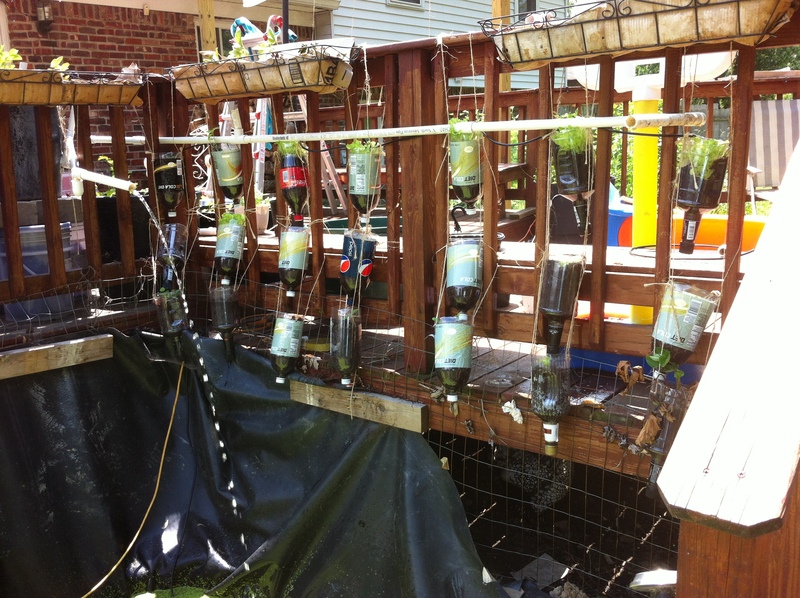 Here are some additional photos and description of our outdoor aquaponic system. I have experimented with different growing systems. From drip irrigation to floating rafts. Do you want to turn your “water feature” into a production space? Contact us and we can help. 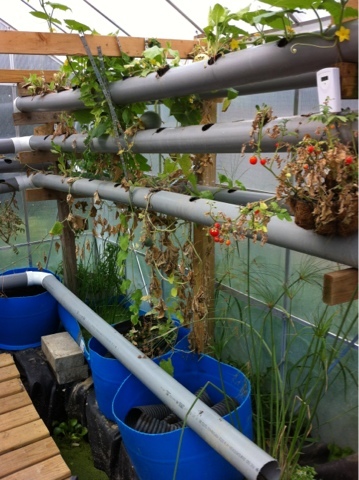 Want your own aquaponic system, again we can help. Q: What do you do in winter? All the plants and the drip irrigation go away, mainly to compost. I disconnect the biofilter, and run a fountain to keep the water from freezing and oxygenate the water. 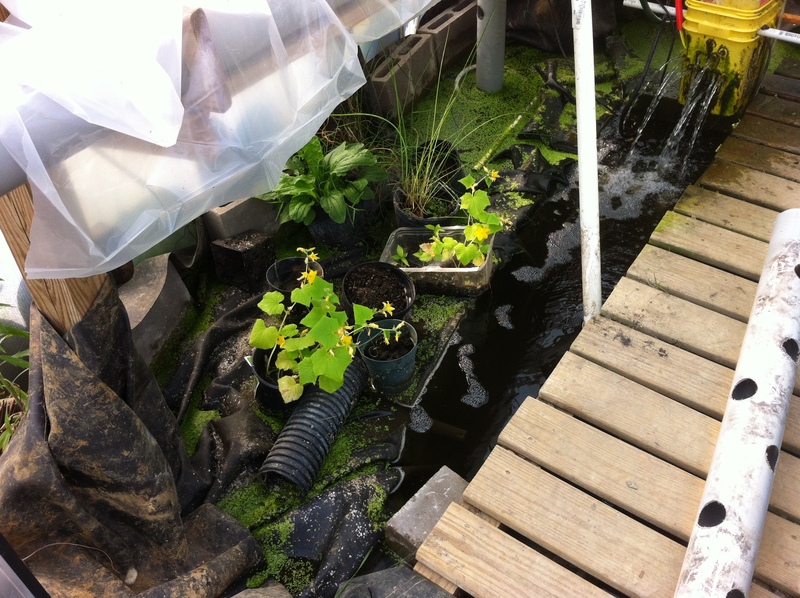 The water plants move to the greenhouse, and a stash of duckweed goes into the greenhouse, and in the indoor system, to be returned next spring. Q: What kind of fish can you use? Any kind of fish that will be winter hardy. You can use koi, goldfish, catfish, bluegill, carp, sunfish etc. You may be able to use tilapia but the water needs to maintain 50 or above and for optimal conditions 70-80 degree water is needed. This year we didn’t get the system cycled in time to optimize the growing season for tilapia. Next year we may put them in once the water maintains above 50 overnight, and then harvest before the water drops below 50. MAYBE 9 moths or less. for now bluegill, sunfish, and catfish are stocked along with goldfish for color. 18 months ago we started with a greenhouse and some barrelponics. 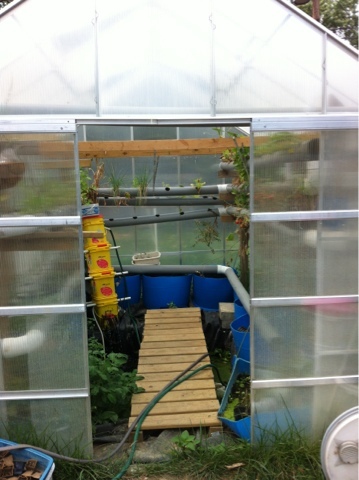 Barrelponics uses 55 gal barrels for fish and growing in an aquaponics system. 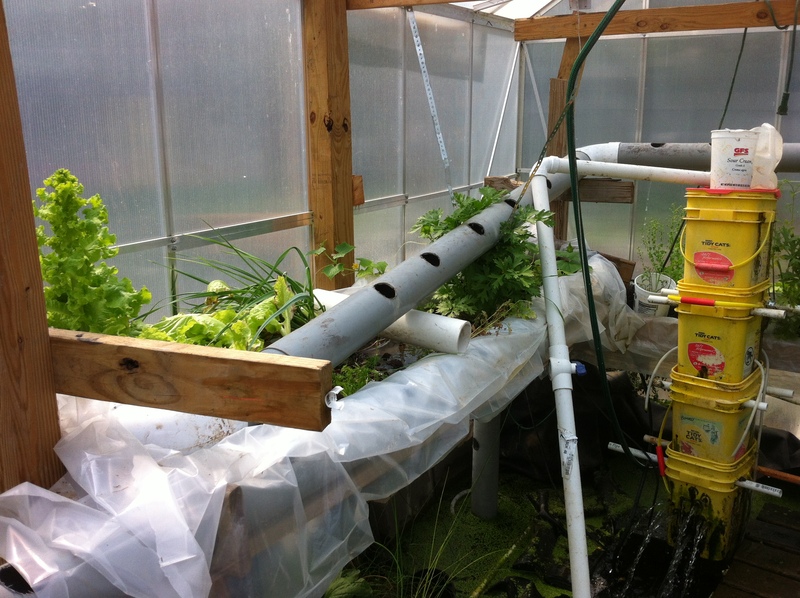 We then moved to a pond liner and the floor being dug out, and used 4″ PVC drain pipe to contain plants. This worked for a while but learned some critical lessons. 1) If you do not harvest the entire plant, the root system will clog the pipes and you will have a reduced flow downstream. 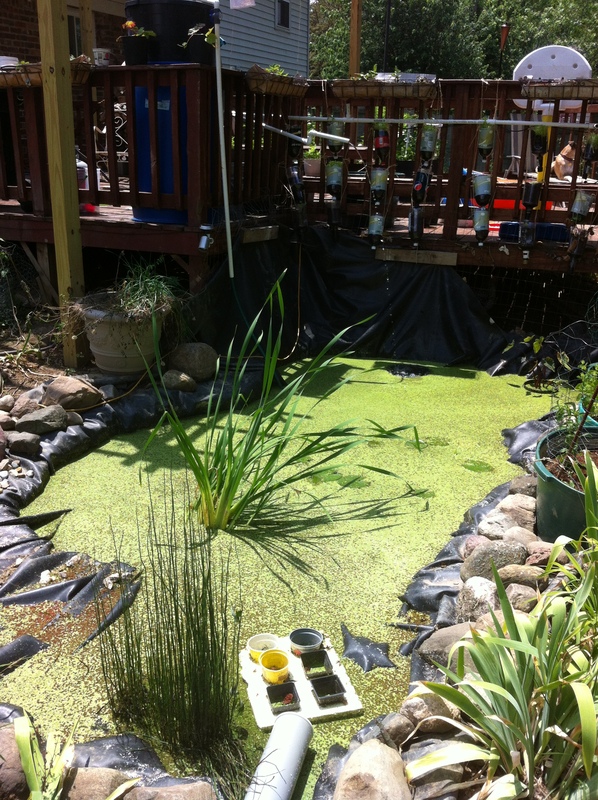 Since we use a constant flow system, this created overflow and loss of water, since the linter only covered the pond. 2) we extended the liner to everything under the pipes. This way if there was a leak or a backup, the liner would catch the water and no water loss. 3) the pipes and greenhouse were not heated this year, and as a result large ice masses formed. These masses were too heavy to support and resulted in system failure. How we fixed the problems. We switched to a grow bed system, which has its own issues and problems but were much more manageable. These problems were grow media, weight issues, and plant support. The grow media was solved by using lava rock from left over landscaping. No increased cost. The weight was solved by adding additional supports and using shelves father than lashing to the support structures. Here is how things look today. We have actually increased our growing area quite a bit. Still have a few more grow beds to add too.